It's tough to make a comparison with pre-split numbers for the company's stock (Nasdaq: HMNY), given we're comparing different quantities, but based on an adjusted estimate by MarketWatch, the pre-split adjusted value (for 250 units, per the ratio of the split) was around $21.25. Compared to that, HMNY is actually down over 90% since the 25th. Ouch. The outage started last night (above) but remains ongoing for at least some MoviePass subscribers (below). While we continue to work through issues with our card-based check-in system, please be aware you can still use the e-ticketing option, where available. We apologize for the inconvenience and appreciate your patience while we resolve the issue. The $5.0 million cash proceeds received from the Demand Note will be used by the Company to pay the Company’s merchant and fulfillment processors. If the Company is unable to make required payments to its merchant and fulfillment processors, the merchant and fulfillment processors may cease processing payments for MoviePass, Inc. (“MoviePass”), which would cause a MoviePass service interruption. Such a service interruption occurred on July 26, 2018. Such service interruptions could have a material adverse effect on MoviePass' ability to retain its subscribers. This would have an adverse effect on the Company’s financial position and results of operations. A company that can't pay its bills is... well, no company at all. 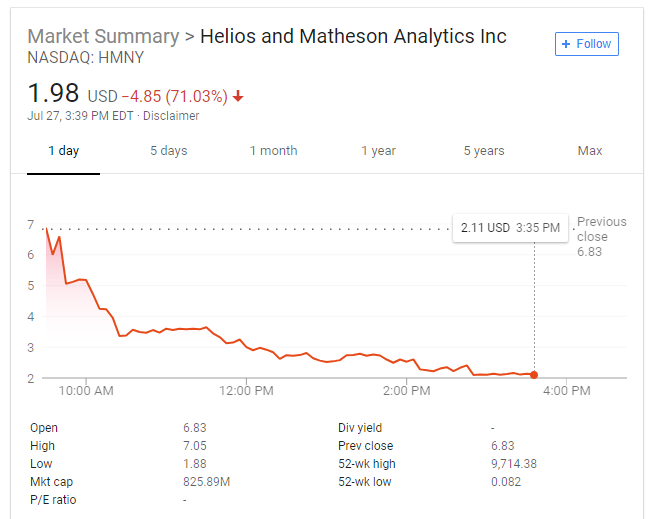 It's confusing that Helios and Matheson Analytics Inc.'s management wouldn't have already prepared and budgeted itself to deal with MoviePass' payment processors. With proper accounting, an event like this should probably have been anticipated with adequate time to make arrangements—if only to secure a loan responsibly before an outage occurred. MoviePass subscribers (like me) should probably consider getting a few last flicks in this weekend, while the company is still around and has the cash to pick up the tab.